The years have been kind to Marcel Desailly, one-time captain of France and a star whose football career saw him play for some of the biggest teams in the world, with Marseille, AC Milan and Chelsea benefitting from his rock-solid performances. In his time, he became the undisputed king of the defensive midfield role, and also played with equal success at centre-back. With the exception of a few extra pounds gained – inevitable for a man now in his mid-40s – he still has an air of invincibility around him, like a gladiator who knows no fear as he strides into the room for our interview. Desailly was born in Accra, Ghana, where, as fate would have it, his mother made a decision that would irreversibly change the course of his life; she married a French diplomat and the consequence of that union for Desailly was a move to France, where he would spend his early life brought up in a culture that was diametrically opposite to that which he left behind when he was just four. The young Desailly started to play organised football for Nantes, whom he joined as a 14-year-old, and never conceived that his football career would take him beyond the realm of his wildest dreams. It was only when he turned 17 and broke into the reserve team, that he realised that this path could take him into uncharted waters, with the promise of fame and fortune if he succeeded. In 1986 he made his professional debut for Nantes, where he became the fulcrum of the team while still in his teens and gained – through regular appearances – the experience needed to smooth the rough edges of his game. His performances attracted the attentions of the more illustrious Marseille and Monaco teams, with both making offers for his services. Desailly nostalgically recalls: “It’s like a child who is in the family house, he wants to move, he needs to move, no matter what the parents are going to give him. Nantes became too small for me. I wanted Marseille but all the family was saying go to Monaco because you are guaranteed a huge salary, but I said no, I am ambitious it’s not just about the money. He arrived at Marseille no longer the big fish in a small pond, and had to work his way into the first team through persistent endeavour and studying of the senior pros. He eventually became a regular choice in the backline, playing alongside the legendary Ivorian-born Basile Boli. His robust performances won him a call-up to the French national team during the qualifiers for the 1994 World Cup in the USA. France failed to qualify in the last-minute of their last match against Bulgaria when David Ginola needlessly lost possession and his error allowed Emile Kostadinov to score, taking the Eastern Europeans through to the final. 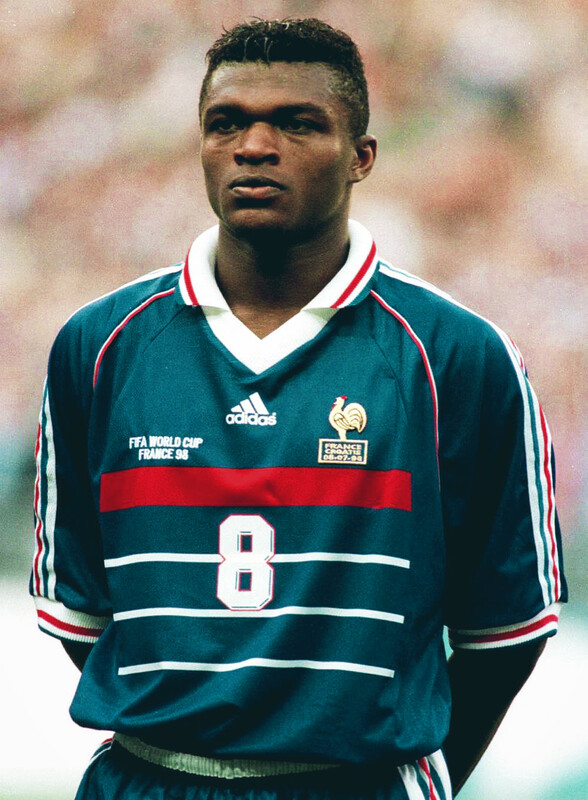 Desailly would have to wait another four years for his first World Cup. Marseille also reached the final of the European Cup in 1993 and were pitted against the might of AC Milan, the then dominant team in European football. Two years earlier Marseille had also reached the final but were unexpectedly defeated in a sterile match by a dogged Red Star Belgrade, whose primary aim, it seemed, was to get to the penalty shoot-out, which they won 5-3. This time, however, Marseille were determined – despite the Rossoneri’s standing – to walk away with nothing less than the trophy, and they did this courtesy of a single headed goal by Basile Boli for a historic win. There would later be recriminations for L’OM as they were stripped of their domestic league title for paying Valenciennes to ease off in a league match so that they could focus on their European Cup final. Their flamboyant millionaire chairman Bernard Tapie would spend time behind bars for his role in the whole fiasco. Months later Desailly was on his way out, leaving Marseille to join the high-flying AC Milan team he had played a role in defeating in that historic final. It was a move that came out of the blue, recalls Desailly: “I still continue to say that my move to AC Milan was not for me. Ariedo Braida who was the sports director of AC Milan came to watch Alen Bokšić because he wanted to buy Bokšić, not me. “Luckily, that day I had an amazing game. I played libero and central defence, and I played my best game for Marseille that season. He put a cross against my name in his notebook to follow up later. When Marseille put me up for sale, Zvonimir Boban in AC Milan got injured, that’s why Milan came and grabbed me to replace Boban, to play as a midfielder. It’s all about luck sometimes,” he emphasises. It was at AC Milan that he became a household name in world football as he seamlessly made the transition from the lesser French league to the summit of European football in Serie A, which at the time was the richest and most competitive league in the world. With the new changes to his football career came the added pressure. The competition for first team places was stiff with only three foreign players allowed to play in any one match and eight players vying for those positions, among them Marco van Basten, Michael Laudrup, Jean-Pierre Papin, Giovane Élber and Dejan Savićević. Against all odds, Desailly took it all in his stride and adapted. “I love pressure. There are some talented players, suddenly they get into a big stadium – an important game – and they can’t deliver. The pressure shakes them and blocks them. 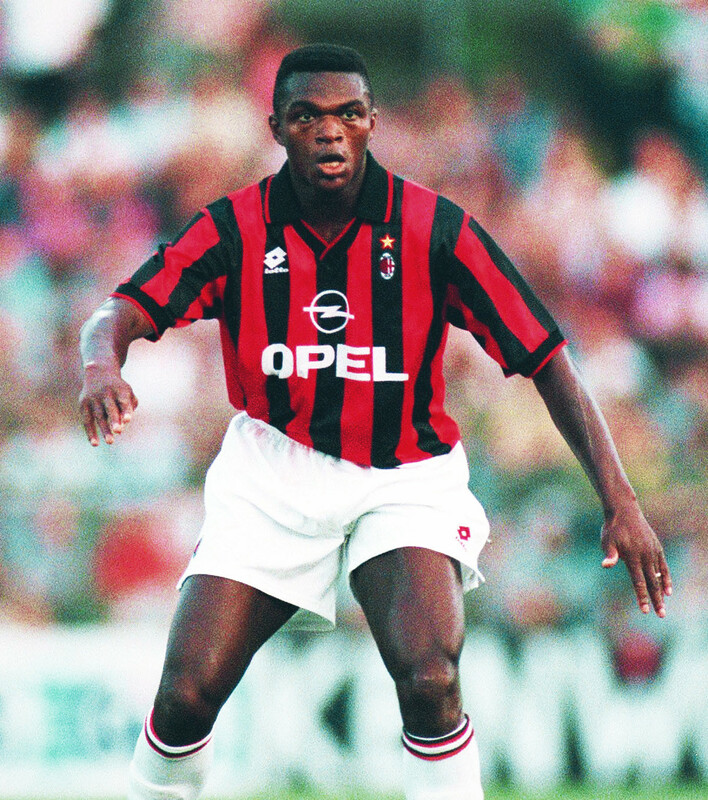 At Milan, Desailly won the Champions League, the scudetto and Coppa Italia on two occasions. Later, the arrival of George Weah, Roberto Baggio and Patrick Kluivert strengthened the Milan team on paper, but shortly after, the team went into decline as club owner Silvio Berlusconi tightened the purse strings. In 1997 Milan had their worst season in a decade and, just before the 1998 World Cup, Desailly was approached by Chelsea’s Director of Football, Colin Hutchinson, about a possible move to the London club. It was an encounter that caught him by surprise: “Chelsea? Which club? What are you saying? I’ve never heard about Chelsea,” said a bewildered Desailly. He arrived in England with a wealth of experience, a big reputation, and no shortage of self-belief. He found, however, that playing in the Premier league was a whole different ball game: “I suffered. My ego got smashed. I really suffered, honestly. Playing against Dion Dublin, Duncan Ferguson; big guys. With time, however, Desailly was able to make adjustments to cater for the differences in approach between England and continental Europe. He took to studying the English game on video, first accepting that it was not possible to win every aerial challenge, instead anticipating where the ball would land when it was flicked on, rather than always engaging in direct combat. He also began to release the ball earlier, knowing that the strikers in England were quite happy to tackle defenders, something he had never seen happen in France or Italy. Desailly’s international career also prospered, but success would only come a few years further down the road. After the failure to qualify for the 1994 World Cup, the casualties of that failure were the elder statesmen, among them Eric Cantona and David Ginola. A new generation of players, including Desailly, Zinedine Zidane, Youri Djorkaeff, Emmanuel Petit and the influential Didier Deschamps, among other rising stars, took up the mantle. The French team reached the semi-final of the 1996 European Championships, losing to the Czech Republic on penalties, but it was now apparent that this was a French team on the rise. In 1998 France hosted the World Cup and their team, having now spent time together since it was assembled three years earlier, was almost the finished article. Carried forward by a tide of intricate passing, clock-like efficiency, and the incandescent skills of Zinedine Zidane, they swept aside everyone before them until only the mighty Brazil stood in their way. From the start of the tournament, Desailly had been the rock at the heart of the defence, complementing his elegant defensive partner Luarent Blanc. The French backline had been virtually watertight throughout the tournament, but with Blanc suspended for the final, Desailly would need to be extra-vigilant alongside the more vulnerable Frank Leboeuf, playing his first match of the tournament. France were outstanding from the start and two headed goals by Zidane effectively ripped the stuffing out of a bewildered Brazil team. In the second half, with 22 minutes left on the clock, Desailly received a second yellow card after a clumsy tackle on Brazilian captain Cafu and was sent off. He spent the last part of the second half in the dressing room dreading a Brazilian comeback but Emmanuel Petit secured victory with a third goal for a historic French win. 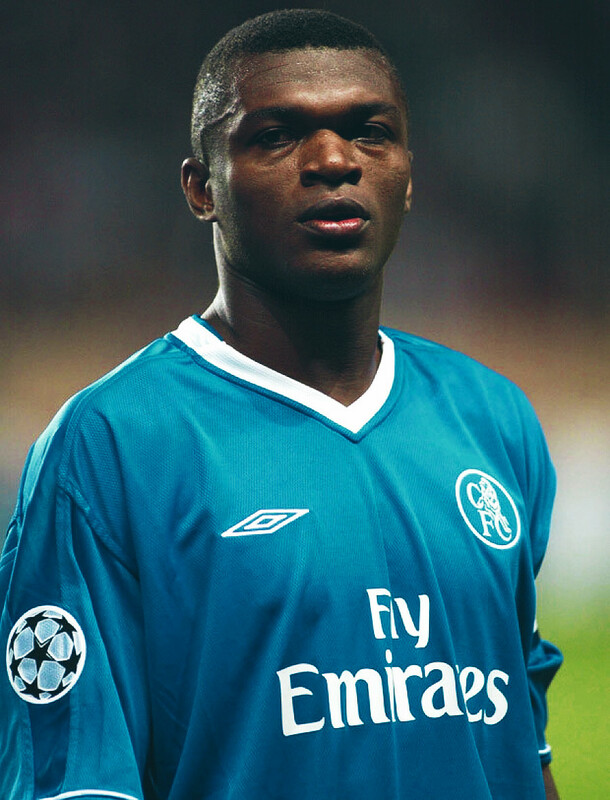 After six successful years playing for Chelsea, Desailly moved to Qatar in 2004 to wind down his career. It was a wise move as he knew that he could eke out an extra year or two in a less taxing league. He won two league titles with Al-Gharafa and Sports Club Qatar in successive seasons. At 36, however, it was becoming harder to keep pushing himself and to maintain the high standards he demanded of himself. The decision to retire would dwell on his mind for several months before he finally made the hardest choice of his extraordinary career: “One morning, I was injured, I was alone in my room, and five o’clock in the morning the sun was already shining hard. I put my two feet on the floor and winced. The family were not with me because I didn’t want them to move to Qatar and I said to myself, ‘it’s time for you to stop’. Having made the decision to walk away from football, Desailly was finally free and he now had to make a decision about what his next step would be as he began a new journey, stepping into the unknown. “I don’t miss the game. Sometimes the 90 minutes, but I don’t miss it. I’m free, I’m completely at ease because it was extremely hard. Some people say it’s easy being a football player. Let them come and put on their shorts. Every morning your toes are cold, the travelling, the pressure, the responsibility. You have to be a role model, you are involved in so many things. Now I am free. I am committed in different things. Over two decades of playing at the highest levels of world football has been rewarding and Desailly has earned every penny he worked for. He acknowledges that after he left football he had to make some adjustments: “I’m a lucky guy because I was not as talented as some offensive players but I gave it my best. We all need money though. “I dropped from the 100 percent I spoke about earlier that I was earning as a football player. It dropped to zero. How can you get back to a certain level of earning? Your capital is what it is, but you can never match what you were earning as a player. There is a drop no matter what you want or say, and then you have to be careful because now you are a normal person. “People still recognise us because we are still doing TV work, but it is nice to be able to do what you want, go where you want and not get into a place and suddenly everyone comes to your table and asks you questions while you are with your wife and your kids trying to relax and have a good time. Freedom: that word, that aspect, means a lot to me. After he decided to call it a day, Desailly started to spend more time in Ghana and, with time, made a conscious decision to make it his home. The lure of the African continent proved irresistible, though he still travels to Europe regularly. “I’m a citizen of the world. I’m French-Ghanaian. What I’ve done is invest in Ghana, created a project called Lizzy Sports Complex with a bit of estate and sports facility, to contribute at a private level to help by building a sports facility.